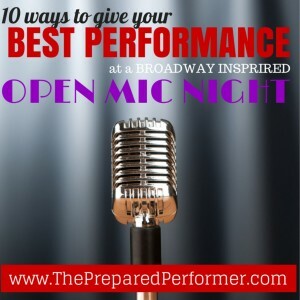 With the Ghost Light Vocal Jam coming up in just a few weeks (July 21st at 7pm), I thought it'd be great to help you all feel prepared to give your best performance. Singing in front of people with an accompanist that you haven't sang with before can be awesome and a little scary. Just like an audition! So, why not take control and get these 10 tips taken care of before you get there. And remember, the best way to get better at dealing with nerves is to get up, and get out, and SING in front of people. So, if you aren't in SoCal for the Ghost Light Vocal Jam, get out and find somewhere to sing in your home town. If you can't find anything like our Jam, CREATE SOMETHING! I guarantee there are others like you looking to get up and sing too! You might have noticed sign ups for the Vocal Jam start at 7pm and the doors don't open til 7:30pm. BUT, in an open mic situation, securing a spot to sing is usually first come first serve. So, I would recommend arriving at least a half hour ahead of time if it's your first time. What a bummer it would be if you put in loads of work to prepare a song and then you didn't get to sing! 3. WEAR SOMETHING THAT MAKES YOU FEEL AWESOME! HUGE!!! SERIOUSLY!!! DO THIS!!! Imagine, you work your booty off prepping a song, you've followed all 10 steps in this post, you go to sign up and find out that someone else is already slated to sing your song. “WHAT!? HOW CAN THAT BE!? I thought I was the only one who really loved singing ‘LET IT GO! '” It doesn't happen often, but it happens! Have a back up jic. Not only is there a chance that someone else might sing your song… the song you bring might be too hard for the accompanist. Or, maybe they have some weird issues with your song and won't play it. You never know what might happen. You should be warming up every day anyway… but especially when you are going to perform! Not warming up is like kicking your face over and over again without stretching. Even if you can do it at the moment, your muscles will be mad at you later. Check out www.freeonlinevoicelessons.com and start clicking away at the video warm ups. Your voice will thank you! If you are just starting out as a performer… it's not everyday that you have a place that people can come hear/see you on stage! AND, how awesome is it to have a group of people who love you cheering you on? Tell your friends that you'll be singing at the open mic an invite them to come and watch – or sing too! One of the best things about living the life of a performer for so many years was the amazing group of friends that I met who are now like family to me. Start building that community now! This is always my number one rule. If you aren't having fun while working as a performer. In my opinion, there is little point. It is so hard to work as a performer and takes such dedication. If you don't love it – you need to step back and think about why you are doing it. Sometimes open mic nights can be a little weird because they audience members might be there just to hear a few select people, or even one person. They might not know how to follow proper theater etiquette and might end up talking through your song. DON'T LET IT GET TO YOU! Remember how lucky you are to be up their sharing your love for the stage with this audience. Remember that you can't hear smiles and while there might be a Rude Rita out there yapping away, there is probably another audience member who is hanging on your every note loving the gift you are giving to the room. Seriously! And, if you are planning on singing at the Ghost Light Vocal Jam. Know that I will be there loving everything you are doing! It's soooo hard to get up and give something that is truly yours to a room full of people. We are BRAVE and CRAZY! And, I wouldn't want it any other way.